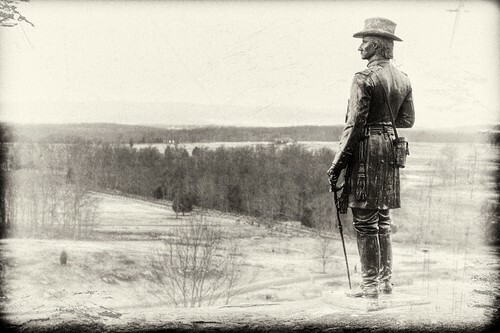 I recently went to the battlefields of Gettysburg, PA and found a statue of General Warren that overlooking Little Round Top. I wanted to make that picture look like it was taken back in the days of the Civil War in the 19th century. I loaded it into Apple Aperture 2 and sent it to Nik Software's Silver Efex Pro to convert it into a black and white image with added grain. The next step was to add the scratches in Photoshop CS4 using the brush tool on a new layer (~75% Opacity). I found a few great brushes - just google for "scratch brush Photoshop" and you will get what you need.